The first thing I noticed about the Samsung Galaxy S8 is its curved screen. The glass wraps halfway around the left and right sides of the phone. 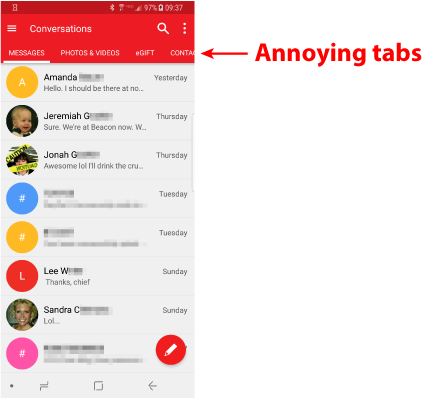 This feature was once specific to the “edge” line of phones, but now it’s foisted upon everyone. And, yes, I’m not a fan. Case in point: To drag an icon from one home screen page to another, you must push the icon over the screen’s edge. I must bend my fingertip around the phone to get the icon to move. It’s annoying. On the right edge of the screen is the Edge tab, illustrated in Figure 1. Swipe that tab in and you get contact shortcuts, weather, and other details, as illustrated in the figure. Figure 1. 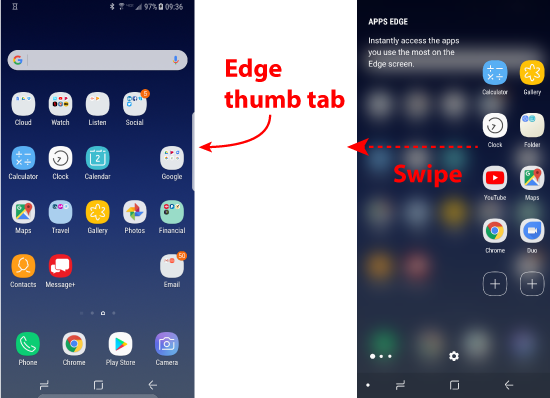 The Edge feature lurks on the right side of the Home screen, over the curved edge. The edge tab is annoying because it overrides any other attempts you have to access items on the right side of the screen. When you need to drag an icon or (worse) when you play a game, the Edge tab takes over, horns in on your space, and causes undue anguish. Yes, you can disable the Edge feature, but you paid for that curved screen, so just enjoy the frustration. The Message+ app is Samsung’s tweaking of the standard Google SMS app, Messages. It features a bunch of tabs, shown in Figure 2, which I’ll never use; I don’t see texting as a social networking activity. Samsung took a clean app from Google and junked it up. Figure 2. The Message+ app with all its bells and whistles. One positive and delightful feature in the Message+ app is that it guesses emojis you might want to use. As you type, specific words are highlighted and changed into buttons. If you press the button, you see a list of compatible emojis. This feature lets an old fart like me suddenly look cool when I write “cake” and can instantly choose the  emoji. Fun, but not a critical feature. Holy cow! How did the phone know? Well, it wasn’t that smart because I get up at 6:30, but I normally don’t grab the phone until later. Sneaky. Still, I’m curious about what else Samsung is spying on. Finally for today comes Bixby, which is Samsung’s Siri/Alexa/Google assistant. Bixby has a dedicated button on the side of the phone. You press and hold to ask Bixby a question. The feature works similar to the other voice assistants, though Bixby has better voice synthesis. Still, you must connect by using your Samsung account and surrender your utterances to Samsung’s “partners.” To encourage you to use the feature, you get XP or experience points. So far I have zero XP, which shows you how much I want to divulge to Samsung. As I continue to use the phone, I’ll cover more of its features. Overall, I like it, despite my grousings.